So October the 9th has been and gone and I am now a Companion of the Holy Royal Arch of Jerusalem or Chapter as it is known. Joining a Chapter (Exaltation) is an extension of your Master Mason degree, some consider it the natural progression for Master Masons. I joined Old Sunning Chapter No 5987 in Berkshire. The Chapter is attached to my Mother Lodge, Old Sunning Lodge (The first lodge I joined) . It was great to join this Chapter as it meant I would already know a few of its members. I also got to meet new people. As with most things Masonic you don’t really know what is going to happen when you join. I will now tell you a bit about my experience but of course I wont be giving away details of the ceremony as it would spoil it for other people. I arrived at Sindlesham for 5pm. It was a weird feeling, as normally I turn up at Sindlesham as a Master Mason attending my lodge or visiting another, I then know what I’m doing and feel comfortable. This night I had the same feelings as when I was Initiated. I was the new boy again!! I made my way to the lounge to grab a coffee and met up with members of the Chapter. I already knew a few of the members so sat down and had a chat. It was great, they were all wishing me well with the ceremony and were very encouraging. I did relax a bit after that! I met up with the Secretary of the Chapter, there was a bit of paperwork to do. The time came for the members to go in to the Lodge, I then had a few minutes on my own finishing my coffee. This is the moment when the excitement/nerves set in a bit. A little while later the Janitor (A member of the Chapter for prepares new members) came out to see me and took me to the lodge room. He had received confirmation all was well and the ceremony could begin. I put on my Master Mason regalia and was then greeted by another member of the Chapter. 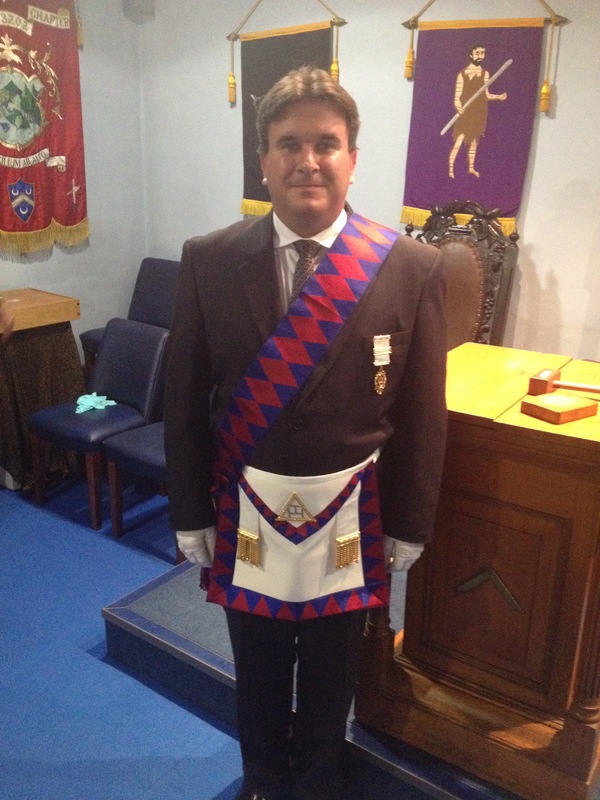 I had to prove that I was a Master Mason, it is a requirement that you are a Master Mason before you can join. The ceremony started. The ceremony was very different from the ceremony of Initiation when you join. It is more of a story/play. I was told by many people that the ceremony was Colourful, I didn’t quite understand this. All I can say without spoiling it is that the meaning of Colourful will be understood when you join. It was a beautiful ceremony and a memory/picture that will stay with me for a long time. Many members took part in the ceremony and it was very obvious that they had put a lot of work into preparing for the evening. I absolutely loved it!! It was a really special evening that I will always remember. The atmosphere in the Chapter was incredible. I am so glad I joined. When I became a Mason my proposer said to me “you will always remember your initiation”. I would totally agree with this! My Exaltation (Joining the Chapter) feels as special to me for various reasons as my initiation. Knowing that many of my friends who had come to visit and watch me joining, were as excited about my joining as I was made the evening even more special. I would encourage any Mason to join a Chapter. I would also repeat the advice I received and that was not to join until you feel you are ready and understand your Craft work first. My Chapter is very happy to let me progress slowly through the Chapter. I requested this as I want to concentrate on my work in my craft lodges first. Once I have been through the Masters Chair of my Craft Loge I will then look to progress through Chapter. Trying to learn too much can get very confusing.